If you've been a smartphone user for any length of time, you've probably thought that you could design a smartphone better than those hacks who had the gall to put the headphone jack on the top/bottom (delete whichever is inappropriate). Well now you can! Sort of. Chinese manufacturer ZTE is putting out press for "Project CSX," a program that will design products based on input from a community of users. The home of the project is over on the company's official forums. According to ZTE's press release, CSX will "engage directly with consumers at every step of the development process." Users can post new ideas to the social board, which other users can vote up or comment on. Those who hit it big and get their suggestion integrated into a project design will be awarded with cash prizes up to $1500 and a shot at a chance to the next CES trade show. The setup is a lot like LEGO's Ideas program, except the final result will be one or more phones instead of playsets. Community members will be able to buy the final product in an early access fashion. The initial submission round ends this month, followed by voting and concept presentation in September, then two more rounds of voting before a grand prize is awarded in October. ZTE does have a few boundaries on the process. Submitted ideas need to be explicitly for a mobile product, the technology suggested must be feasible in a 2017 timeframe, and the final product must be "affordable." Those restrictions seem a bit, well, restrictive: when it comes to mid-range, affordable smartphones, the market is already saturated with a ton of solid hardware. What more are you going to add, aside from things like a fold-out keyboard or a super-tiny form factor, which have niche appeal at best? 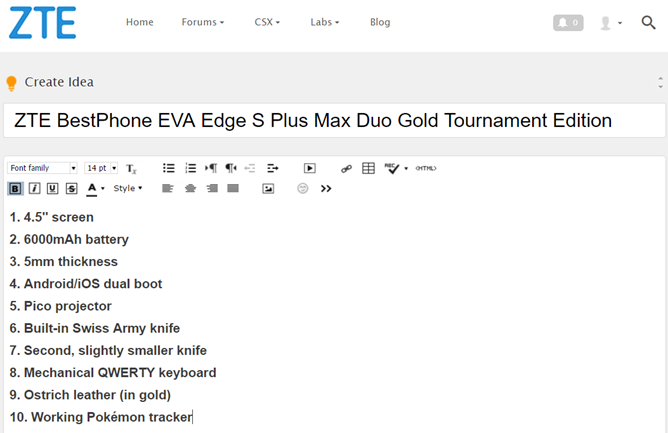 Software ideas seem like they're more ripe for execution, but ZTE's software skin is already regarded poorly. It's telling that one of the highest-voted entry so far is simply calling for less bloatware. Other upvoted ideas are rather generic, such as "focus on usability" and "emphasize battery life." 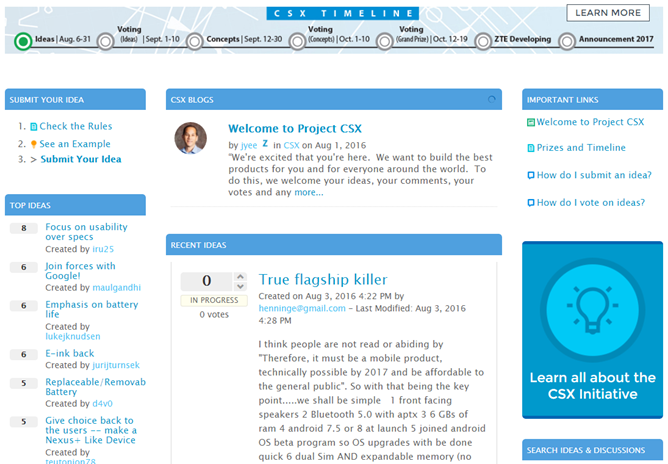 The cynic in me says that Project CSX is more of a promotional move than an actual collaborative effort, that ZTE wants to boost customer engagement and maybe have a marketing campaign for "the world's first crowdsourced phone" sometime next year. I'd like to believe that the company will truly consider the ideas its users submit, even the more outlandish ones. But the realities of smartphone production, especially given the time and budgetary constraints, make it seem like that's an optimistic idea at best. Richardson, Texas – August 3, 2016 — ZTE USA, the fourth largest smartphone manufacturer in the U.S. and second largest in the no-contract market, * today announced the launch of Project CSX, a crowdsourced mobile device the company will release in 2017. ZTE’s member-led forum, Z-Community, will serve as the platform for ideation and feedback throughout the entire development process. To join Z-Community, submit your ideas, and learn more visit https://community.zteusa.com/.